How do you value the results of your craft? It’s one of those questions that’s always hard to answer, and harder to answer as a writer than, for example, as a carpenter. A carpenter makes a table. He cuts the wood, joins the pieces together, sands down the rough edges, lays on a few layers of varnish, then polishes it all up, Then if he adds up the cost of the materials, and ascribes some base value to an hour of his life, he can figure out how long he spent making the table. Add a reasonable percentage on top and voila he has his value, and can look to sell his table at a price that reflects its worth. If he is a highly skilled craftsman making bespoke furniture he can charge a little more, because people can see the value in his work, but ultimately they are paying for a singular item with a solid as you like value. For a writer, however, the value of his craft is something much harder to ascribe. Ironically because while what is written is singular and unique in nature, the way we market it is not. If for example, you add up all the hours I spent on thinking about, writing, editing, redrafting, proofing, final editing, typesetting, revising again, when I wrote Cider Lane. In the same time, our carpenter could have made a fair few tables I would posit, or else he would have made a very beautiful and very expensive table. The novel it took me a year to write between the first word I typed on the screen and it reaching publication. Add up the hours spent and you get a rather large figure. 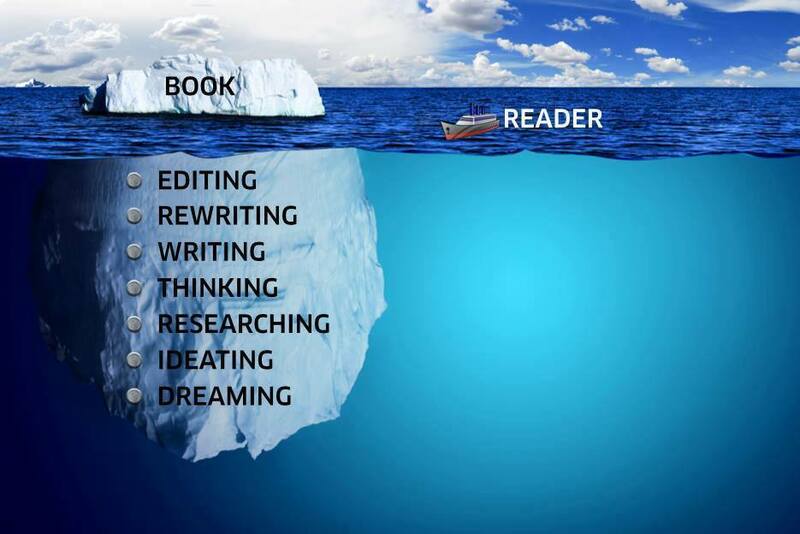 One which a reader does not as a rule see, hence the iceberg below. Despite this the craft of writing is for me a labour of love. I don’t write to make a living, I have a full time job and writing is a hobby, though if I could make a living doing it I would, truly professional authors are few and far between. While I get my share of readers, I would need to sell a whole lot of books to replace my day job, and that’s not going to happen any day soon. This does not mean I do not want to be paid for my work, it’s not how I pay the mortgage, but fair recompense for the work I put in would be nice. All the same it is hard to ascribe a value to your work. A balance between trying to find new readers and trying to get a fair return has to be struck, and unlike our carpenters table placing that value on our work remains a difficult proposition. There is compensation, however, as when we sell a book we can sell it to more than one person. the words we craft are not carve into a stone tablet by hand after all. We can figure out the cost of paper and ink easily enough, print on demand sites will tell you exactly what the minimum is and we can just add a value to that to figure our the price of a book. I use Createspace for my own, though they are plenty of others. Some possible better, a few worse. I’m a Bibliophile, I like seeing paper copies of my novel, and like selling them direct when I get a chance, though the paperback market is not where I sell most books, it is still somewhere I like to be. E-books are however the main marketplace for new and aspirating self published authors. E-books which bring their questions of value. With the E-book it’s not even a physical thing we are selling, just binary strings that hold together to form a readable text. We’ll sell it, then we sell it again, it’s a never ended supply of binary code. Which make it harder to ascribe a value, because ultimately your selling nothing but a copy of that code. All the same, however, how do you place a value on a novel, it’s not just about the time spent writing it. A novel, any novel, is a little pieces of the writers soul laid bare. I say this fully aware of how pretentious it sounds, gleefully aware in fact. Market economists (a grey inhuman bunch, lack any real soul) would tell you that the market finds its own values, through supply and demand. (see note). they would advise however that if a new writer wants readers he is best advised to give his work away. Make it free and they may come…. create a free supply and your will be at the peak of the demand curve. Which is true enough, but do people value anything they get for free? I know myself I have seen free e-books advertised and ignored they simply because ‘if it’s been given away its probably not worth anything’ . I am a child of consumerism after all. yet if you set a price at the minimum ( on amazon that £0.99 ) it may drag in a couple more readers but still it suffers from the ‘if it’s cheap it must be worthless’ factor. Other readers have go so used to free books on the internet they just don’t understand why they would have to pay for something. I have genuinely had people cursing at me on +facebook for saying no when they ask for a free copy. the world is ever a strange place, and people expect something for nothing for all they value it less for being free. 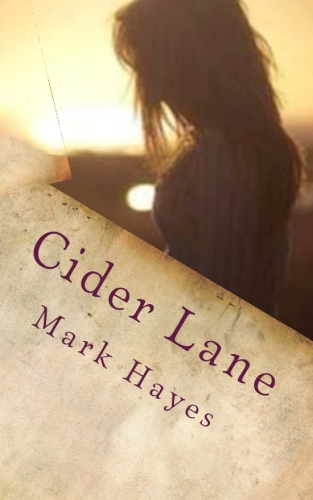 I recently dropped the price of Cider lane from £1.99 down to £0.99 in the hope of selling a few more books. Which is what inspired this ramble, or the mixed feeling I had about doing so inspired it at any rate. I know that while I care nothing about money made from book sales, I do care about people valuing my work and the feeling of value I ascribe to it myself. Readers are important to me, I would not want one reader paying me the true value of my work (I did the maths and on hours alone its about £20,000 worth of work in time). I would vastly prefer 20,000 readers, but it still feels like giving it away. As does the option to do just that on amazon for a week which I resist all the same. Artists (any for of artist) seldom get true value for the work they produce. Less so in a culture that glorify’s the average, pays footballers millions, yet wants movies for free. Note, I am doing a degree in politics philosophy and economics. What I have learned is this. Economics is politics with the humanity removed, people are figures on a spreadsheet, their hopes and dreams an irrelevant factor. They never consider if they should do something, only the effect it will have on the little green bits of paper they obsess about if they do. this is why few socialists are economists. This entry was posted in books, cider lane, pointless things of wonderfulness, publication, writes. Bookmark the permalink.